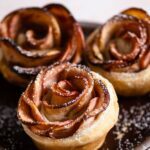 Easy Apple Roses Recipe baked with homemade puff pastry. Fun fall dessert flavored with red wine, honey, cinnamon and nutmeg. Make a batch of Homemade Pastry Dough the day before and cut into half. Prepare a large six well muffin tin with baking spray. Combine cinnamon and nutmeg in a small bowl. Slice apples in half and then using a mandolin slice into thin half slices. Cut away any leftover core. Place Apple Slices in medium bowl and soak with wine or blackberry juice for 30 minutes. Remove apples slices from bowl, shaking off excess liquid. Arrange apple slices on a plate, try not to overlap too much and heat in microwave for 2-3 minutes or until soft. Roll out pastry dough into a 1/8 inch rectangle. Cut into 9 inch by 2 inch strips. Using a pastry brush, coat strips with a thin layer of honey. Sprinkle honey with a little cinnamon and nutmeg. Fold the bottom part of the exposed pastry up and over the bottom half of the apple slices. Roll until you have a coiled circle of pastry and apples. Turn the apple end right side up, with the pastry as a base. You should now have an apple rose. Gently place the apple rose into a muffin well. Repeat with remaining dough and apples. Let apple roses cool in tray for 5-10 minutes before removing. Sprinkle with powdered sugar and serve with ice cream!